come form a time aera when listening to music was the main attraction and entertainment in the living room and oftern these units were quite beautiful pieces of furniture and luxuriously equipment with quality equipment. No epxpense was spared to provide roomfilling and impressive sound. What makes stereo consoles desirable today is their vintage sound and experience. As with other vintage audio equipment, stereo consoles are subject to aging and only those units that were serviced in regular intervalls (which most are not - due to bulkyness) are still in fuly working condition. Without completely refurbishing the unit entirely in every aspect, it won't provide reliable, lasting or qualty performance. So, if one is found in still working condition that won't do much good, as the effects of time have rendered internal components and workings in less than optimum condition, especially if the unit apppears not to have been used often . The traces of time cause in varying degress: Rubber parts age and wear, lurication hardens or dries out, solder points become brittle or intermittened, and contacts, controlls, connectors become dirty and oxydized. lamps burn out, other parts shift out of tolerance, and electrolytic capacitos leak current, all resulting in: poor audio quality, poor radio receoption, a record changer that no longer changes and plays too slow, or drags, dirty and noisy signals and hum. My goal with any equipment that I refurbish is to address ALL of above issues where ever possible in as much detail as possible, to provide equipment that performs as close as possible to original specifications and reliable - aiming for decades of trouble free operation to come. Anything less than that does not make sense! Quality work takes tremendous resources of work time and parts, which often are hard to find. Please take these facts into consideration when evaluating the prices shown here.  Fully Re-Worked! Replaced all components affected by age for reliable performance! Description: This 1966 classic US made piece of American Audio history is presented here as a one time opportunity to own a reliably working piece of equipment in very good and re-worked condition. Due to extensive re-work it offers fresh and vital sound and will work reliably for decades to come! The electronics of this unit features truely vintage sound -a very different experience compared to modern stereo equipment. 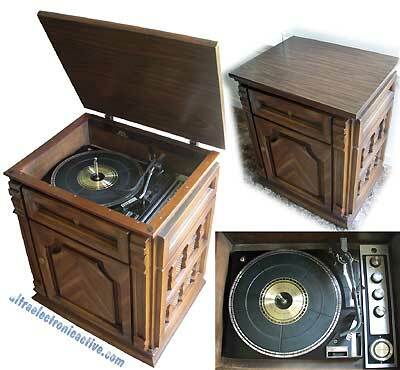 This console's record changer features the famous british made Colaro Conquest model. Listen to music the way our parents and grandparents did. 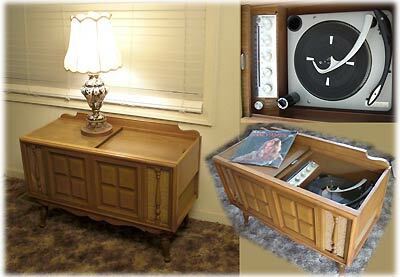 This vintage stereo console offers all needed for the vintage audio experience, such as a FM / AM tuner but also offer an AUX input to connect an iPod, CD player, or other audio device. The Colaro Conquest changer is a very nice quality 4 speed changer (16, 33, 45, 78 RPM) that plays all record types with ease, and allows to stack records for uninterupted play.  Famous Colaro Conquest 4 Speed Record Changer - One of the most sophisticated changers - beautiful to watch! The record changer of this unit features the famous "Micromatic" changer chassis which is very similar to the "Collaro Conquest" changer (uses the same technology! ), which actually "feels" record sizes and thus is able to play records of different sizes fully automatic, if stacked larger to smaller records. This model is quite luxorious and takes the famous portable model to the next level, which now features 8" wooders and just like the portable a 2 way speaker system. In addition this unit features also a FM / AM tuner, an AUX input (for your iPod!) - the portable unit which does not have a radio and offers only one full range speaker. You will be impressesed by this unit's quality and sond! -- >>> More Stereo Consoles Below! Features: the knobs and buttons at the radio section (bottom to top): Speaker selectror rotary switch: Internal / Both External; Tuning (radio), Bass/On/OFF control, Fucntion selector rotary switch: Stereo Phono / FM stereo / FM / FM AFC / AM / AUX; Loudness, Trebble; Record changer: Switch: OFF, ON, AUTO; Selector: 16, 33, 45, 78. Flip-over stylus for LP and 78's. Speakers: 2 Way: 8 " wooofer (facing side ways + 5" tweeter (facing front of the unit). To mention: Thsi unit is also designed to be used as a table-top inut. Legs and trim can be easily removed. Without legs: only 15" tall. Work performed to present this unit reliably working condition: Replaced ALL electrolytic capacitors throughout the entire unit, including the frequency net work capacitors for the Tweeters. Re-soldered aged solde0r points, upgraded the pilot light with LED teachnology (wiht th egoal, that it will never need to be rpeced again). Restored all contacts, switches, potentiometers and the tuning capacitor with quality contact cleaner; Tweked alignemtns. Refurb work on the record changer: re-worked rubber parts; re-lubricated mechanical parts.  AUX input for iPod, CD etc.  Super Small Console: Only: 20 x 17 x 24 !  AUX input for iPod / CD, etc.  Stand alone / Self contained No messy wires speakers etc. All components built-in, including the speakers. Description: This is the smallest stereo console I have ever had - It's cute! A piece vintage US made audio equipment (made with foreign components) that was reworked to provide years of trouble free serice. This stereo was very likely made between 1975 and 1978. It is complete and stand alone, meaning the amplifier and speakers are built-in - Nothing else needed - ready to play! In addition the unit offers the hook-up for external speakers (if wanted) and the unit provides and AUX input to add an external piece of audio equipment such as an iPod, etc. It's record changer plays all record sises (7" 10" 12") and offers 33, 45, 78 RPM speeds with the needed flip over stylus to play 78's. The unit was re-worked to be fully functional with addressing issues for long term reliability. This includes to re-work all mechanical parts in the record changer chassis. The unit is is in nice condition - excellent and clean typica signs of usage. - Play yer ol records again! - Bring back the feeling of precious memories or create new ones! The unit has a FM/AM radio, but the radio is a bit flimsy. 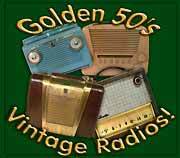 While it all works and receives strong local stations well, it does not do so well with harder to get stations: So don't get the unit for the radio, but for the record changer, which works well and sounds great! Features: All the knobs and buttons, radio/ amplifer section: (bottom to top): Radio tuning dial; Function Selector Rotary Switch: AUX/ AM/FM; Power switch and volume control: OFF/Volume; Balance: Left - Right; 1 Tone control: Bass - Trebble; headphone jack; Record changer: Switch: OFF, ON, AUTO; Selector: 33, 45, 78. New Flip-over stylus. 20" x 17" x 24"
1. 1950's Magnavox Tube amplified stereo furniture type Stereo Console. Very Nice warm sound! Speakers: 15" woofers + Jensen horns; Record Changer : The famous Collaro Conquest chassis; AM-FM radio. 3. Zenith 1950 Tube Console. Consists of: Cobramatic Record Changer. Tube Tuner. Tube pre-amplifier. Tube Power Amplifier. 6. 1966 Magnavox Solid State Stereo Console Consists of: Record Changer updated revision of famous Collaro changer. Magnavox tuner amplifier Buitl-in 2 Way Speakers: 12" Woofers with Jensen Horns. A nice quality and luxorious console. 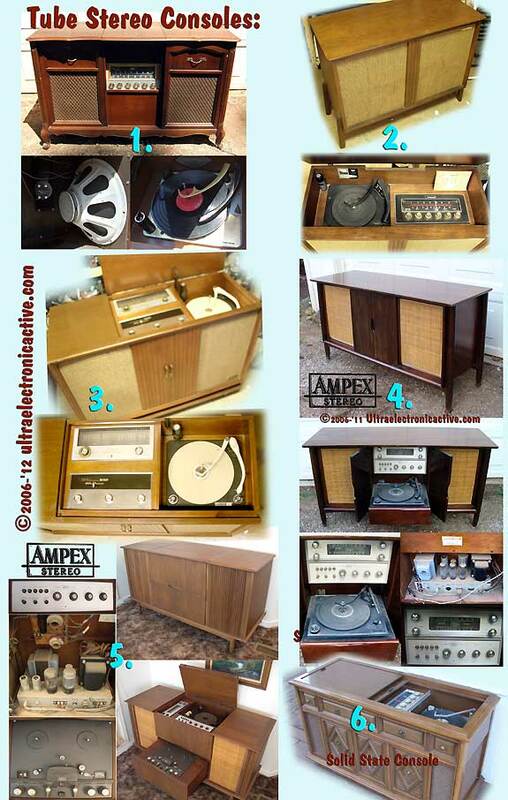 "#3 Zenith Tube Stereo Console"
--> Please refer to item nubers shown in photo AND: add type of unit from the picture ! 2-10 Weeks Lead Time - The goal with my work: to bring these fine pieces of vintage audio equipment back to as close as possible to original specifications and to provide each in reliably working condition for decades to come! This takes hours and hours and douzends of hours of paistaking detail orineted work. Restoration of a stereo console, due to a lot of items to work on, typically takes 1-5 FULL work weeks of labor time +parts to achieve this goal. Thus prices based on the actual amount of time and parts needed (and: some of the parts are quite hard to find! - which takes more time again!) Prices for the items shown here in fully restored condition typically are $800-$7500. As dedicated work time to focus just on one project is in very short supply, the best time to order any one of these units will be in the summer ( - May through August - ), as at other times I may NOT be able to serve you very quickly, especially during late fall, winter and the first two months of the of the new year. A note: R u s h i n g it and vintage audio equipment, or pushing for "discount prices" do not go together! Quality work takes as much time as it takes, to do it right - and right the first time! - And: often for equipment of this age it takes to complete one step and then to get back into it, over and over again, to improve and tweak until all is perfect before moving on, so that it will be perfect when finally shipping! If needing to rush: Please inquire for these units in "AS-Found / AS-IS" condition - I do not compromise on the quality of my cratsmanship! Thank you for your understanding.